For tedious fastening jobs where nails won’t do, there’s no better helper than an autofeed screwgun. Screwguns do only one job and they do it very well: automatically sinking screw after screw to a preset depth. 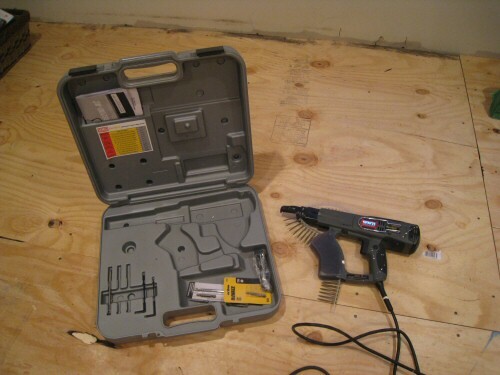 Screwguns eliminate fumbling with individual screws or accidental overdrive (pushing the screw through the material). They feed screws on a plastic chain and are functionally similar to (though mechanically very different from) pneumatic nailers. Over the past weekend, we worked a very tedious floor leveling job that required an extra 3/8″ layer of plywood to be fastened to the existing subfloor (details of the project are forthcoming, complete with a host of pictures). To fasten the plywood, we used a Senco Duraspin DS200-AC on loan from a good friend. The Duraspin put in more than 750, #8, 2-inch screws over two days. This job is similar to hanging drywall in terms of setting screws, although plywood is more pliable and less prone to overdrive than sheetrock. The Duraspin can be used with drywall, and according to the friend who lent us the gun, it performs well in this scenario. The Highs: Consistent drive to preset depth of most screws in a chain; no jamming over 750 screws; easy to swap bits; easy to reload; easy to learn to use; and, most importantly, a huge time saver over the alternative. The Lows: Occasionally underdrives screws (especially when the bit gets dull); high price for screws. The Verdict: A must-have tool if you’re driving more than 100 screws into any surface. Senco sells a variety of models of this tool that can handle a wide variety of screws. Fastener type: This tool is designed to drive up to #8, 1-inch to 2-inch screws. Bit type: The tool uses 4-inch long bits that are standard on many screwguns. We used a square-head bit, since that was recommended by a friend. You can also drive phillips head screws with an alternate bit, and we suspect there are some star-head and hex-head options available. 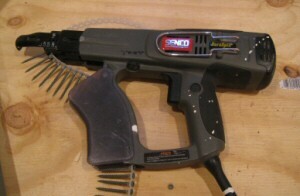 Trigger: The Senco features a variable-speed trigger and allows the gun to be locked on. This keeps the motor spinning but the bit only spins when the clutch engages when pressed against a screwing surface. Fine Depth Adjustment: After setting the tip for the right screw length, the bit can be slightly moved in and out to set a precise depth for countersinking. There are no bells and whistles or fancy contraptions with the tool, which we like. It is a relatively simple design. Subfloor installation: We used the Duraspin to drive more than 750 screws in the subfloor. On average, we had to use a drill-driver to follow-up on a screw that hadn’t fully sunk about 5-10% of the time. When the bit on the Senco gets dull (about 400-500 screws), this percentage rises consistently until it becomes intolerable. Fortunately, we found that the Durapsin did not eat away the head of the screw, so it was easy to finish off misfires with the square-bit-equipped drill-driver. We never encountered a situation where the Senco was unable to drive the screw due to resistance. Drywall installation: We didn’t have a chance to test this gun for drywall installation, but suspect it would perform very well in this environment. Drywall screws are shorter than what we used for the subfloor and drywall exerts less resistance than plywood and OSB. Overall, we’re very pleased with the Duraspin, and definitely recommend this tool if you have a serious fastening job in your future. You can find the Duraspin or a comparable product at a variety of home improvement big box stores. Amazon also sells the Senco Duraspin for a little over $100. We bought collated screws at our local Home Depot. You can also find the tool and fasteners at Lowes and other hardware & tool stores. This would have come in handy for the recent post on drying walling the basement.